El Salvador is a small country in Central America - the most densely populated in the region. It opens excellent possibilities for calls termination, because international traffic is generated by Salvadorans working in other countries and tourists attracted by local beaches, surfing locations and mountain groups. The average rate for this direction is $0.07- $0.10 per minute of conversation. The growth of telecommunications sector in El Salvador is somewhat limited by poor infrastructure and unequal distribution of income. Nevertheless, in 2017 the situation has improved significantly, and the telecommunications sector is one of the most successful in the country's economy. Mobile penetration is very high - the penetration rate is 146%, and this is above average for Latin America and the Caribbean. Operators are actively competing with each other, therefore they are forced to reduce the costs of their services. You can buy a SIM-card either in the mobile operator's office or from the street vendors. The cost of one start plan is from $1 to $1.5. The second option is preferable, because in the shops you will be asked to show your passport. You can top up in supermarkets, grocery stores, pharmacies and gas stations all throughout the country. 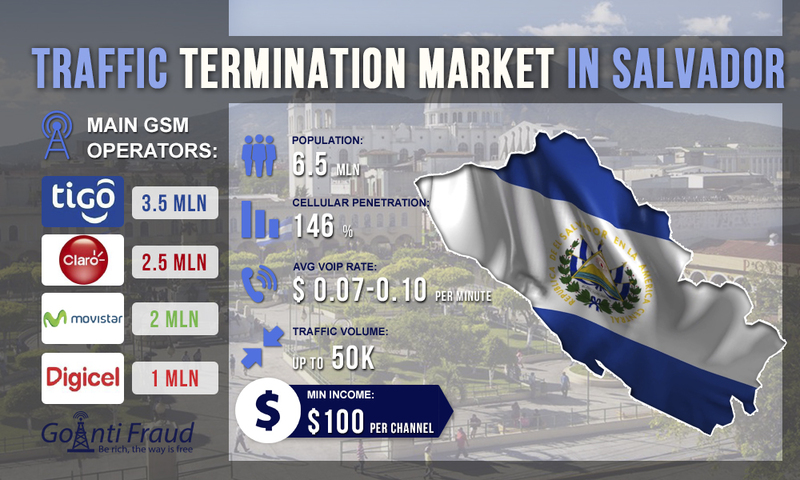 With voip termination wholesale rates in the direction of El Salvador of about $0.07- $0.10 per minute, local tariffs for calls are quite expensive ($0.12 per minute in the network and $0.14 per minute outside the network). But there are different packages within which a minute of call will cost up to $0.06. Working for 5 hours a day, you will be able to receive revenue of $100 and more from one channel of equipment.